It is common practice for anyone thinking about a tech project to approach form and function as separate parts of the process. This is how many of us have been taught to dissect a project. There are even different teams devoted specifically to each – the development team makes sure everything works, then the design team steps in and makes everything “pretty”. As a Salesforce consultant working with nonprofit organizations I have felt the rub between form and function first hand. Too many times, function is prioritized and form is viewed as a “nice to have”. The problem that this creates however, is that users end up with a system where the interface is difficult to use and data is not easy to interpret and act upon. This leads to the “bad data death spiral”. Whenever you start a new project, always think about form and function together. Ask questions like, “Who will enter this data? What order will they enter it? Once entered, how will this data be used?” to help guide the process. The great news is that Salesforce recognizes how important a good user interface is. Recently they have come out with a number of great ways to marry form and function without writing code. With the release of new Salesforce Lightning functionality it is easier than ever to create a well designed UI that allows users to get to the information they need quickly and act upon it. We have more tools than ever to make form a “must have” instead of a “nice to have”. Consultants, check out Trailhead to brush up your skills on these awesome new tools! What are ways your organization has incorporated form and function? 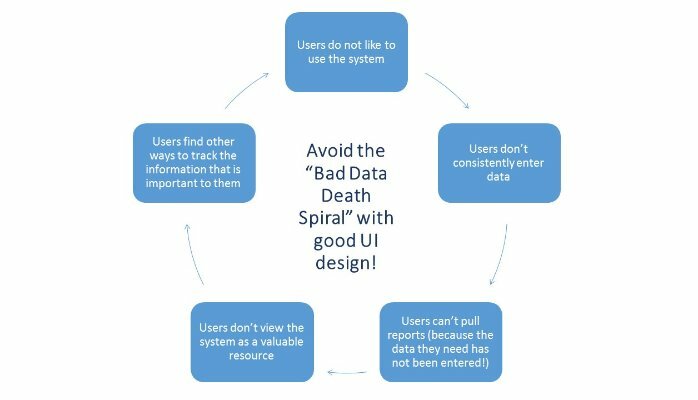 Have you experienced the “bad data death spiral”?